Founded in 2005, Coveo is the world leader in research powered by Artificial Intelligence, providing content recommendations for businesses. Coveo currently employs 300 people with offices located in Quebec, Montreal, San Francisco and Amsterdam. Their mission is to improve the digital experience of clients and employees by providing them with the most relevant information in a proactive and contextualized manner. Coveo is experiencing rapid growth at a rate of 50% per year, making recruiting increasingly difficult for their human resources team. In order to support the balance between the company’s objectives and their workforce, Coveo has to differentiate itself as an employer of choice by offering total compensation and benefits that stand out. It is crucial for Coveo to also maximize employee retention and productivity rates in order to support their rapid growth. "Dialogue is a real game changer for our employees. All they need is a few minutes and a smartphone. It only takes avoiding a single visit to the clinic to love it! It’s a privilege that we can no longer go without." 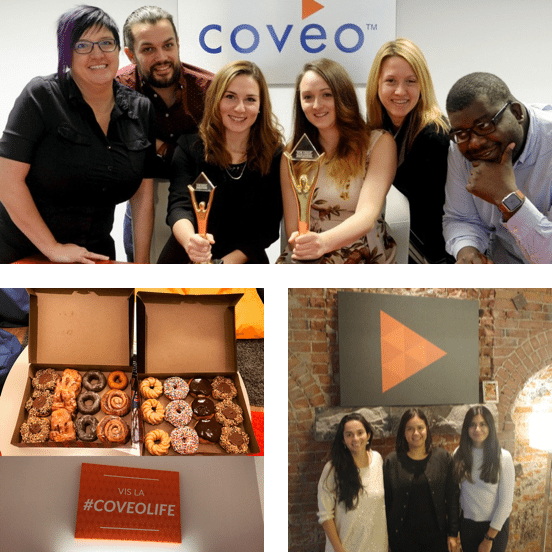 With two offices in Quebec and employees working remotely in Ontario, Coveo wanted to offer a corporate benefit that would appeal to all parties. Dialogue was the perfect fit. 72% of video consultations with doctors occurred during business hours. In addition to keeping employees present at work, the company believes it saved hours related to planning appointments, going to the clinic, time spent in waiting rooms, and so on. For the remaining consultations that occurred outside of business hours, employees didn’t need to take any time away from work in order to be proactive in taking care of their health and the health of their families. "When we first learned of Dialogue, I remember thinking to myself, ‘this must cost at least a hundred dollars per employee per month.’ To my surprise, the cost was only a fraction of that, and it included family coverage. At that moment, I felt like I was getting my money’s worth and now that it’s implemented, I know for a fact that I am." After only four months, the company noticed a 0.7% increase in hours worked among its Canadian employees. That’s more than one additional hour worked per employee, per month. Despite the fact that many of Coveo's employees already have a family doctor, the company says appointments with family physicians are rarely instantaneous, and it can take days to meet with a doctor. Dialogue gives employees same day access -- and in some cases, within minutes! When it comes to calculating the monetary gains of drug savings, Coveo is easily able to see the return on investment.The company anticipates a positive impact on the renewal of their insurance premiums year-over-year. Whether it be the premium that the employer must pay, or the portion that the employee pays, the cost savings allow the company to realize a quick return on investment. Coveo covers two-thirds of the insurance premiums, and each percentage point of the experience rating in the eyes of the insurer represents enormous savings for the company. While lower absenteeism rates and overall drug savings have a quantifiable impact, it is more difficult to determine the precise value of this third dimension. Qualitatively, Coveo has received a lot of positive feedback from employees who value the service immensely, particularly since it is only available through employers as a group benefit. For young professionals, Dialogue helps to differentiate an employer as one that goes above and beyond to ensure the wellbeing of its employees and their families. There’s no need to miss work to see a doctor or nurse. Consultations can be done from the comfort of home or from work. Dialogue is available as often as employees or their families need it, as soon as they need it… without endless wait times. With services like info-santé and 811, patients are almost always referred to the clinic or the hospital. Dialogue enables immediate intervention, offering diagnoses and prescriptions through videoconference right from a smartphone. Employee satisfaction as a result of interacting with Dialogue is very high, and employees make sure to let their employer know! Coveo is thrilled by all the benefits Dialogue has provided them, but what truly validates the service is their employee satisfaction rate. Dialogue has a Net Promoter Score (or NPS) of 54 amongst Coveo employees. The NPS is calculated by analyzing the results from 0 to 10 in response to this question: how likely are you to recommend Dialogue to a friend or colleague? It is therefore not a raw percentage satisfaction, rather the difference in the percentage of detractors (scores from 0 to 6) from the percentage of promoters (scores of 9 and 10). Scores of 7 and 8 are considered passive. Claude-Antoine does not hesitate to recommend Dialogue to other companies, saying that their organization will be proud to offer this benefit to their employees, and it will help them stand out as an employer of choice! "Dialogue is an added value that we provide that our employees would not otherwise have access to personally." Regardless of how frequently Dialogue is used, Coveo’s Director of HR says that his employees feel privileged to have access to Dialogue when they really need it. He himself is very happy to be able to benefit from it as a patient of the healthcare system, and as a father! Like Coveo, reduce your absenteeism rate, save on health related costs and most importantly, get an edge that will set you apart as an employer by adding Dialogue to your current employee benefit plan.